On Saturday afternoon, I drove to Staten Island not knowing whether my house still stood. So far the only report I’d had came from my friend Anya, who hadn't seen my house but said that poles and trees were lying around my street. I felt guilty about not going there earlier, but there was the question of transportation, then the question of a car, finding gas for the car, and finding somebody to drive me. I felt guilty for neglecting my house during the hurricane, even though I had abandoned it two months prior to that. My mother died, my son left for college, and since there was nothing tying me to Staten Island anymore, and many things tying me to Manhattan, I had to move. The house stood empty and ransacked, waiting to be put on the market. As I drove toward downtown, I tried to anticipate what damage my house had suffered. Irene had damaged the deck. A hurricane that came before Irene had stripped us of part of the roof. Another hurricane had uprooted our huge pine tree. Considering the reports that came from Staten Island in the aftermath of Sandy and my friend’s Anya’s words, I had very good reason to worry. Yet, it was hard to imagine the scope of the disaster, especially if you lived on the Upper West Side. The atmosphere there was even more festive than usual. Central Park was closed, so the joggers and the dog-walkers—all happy-looking and brightly dressed—were vying for space on the sidewalks of Central Park West. All the restaurants on Columbus and Amsterdam were crowded, with enormous lines to get in. People carried bags full of alcohol and dessert for Sandy parties. The only signs of the recent hurricane were a few fallen trees—especially in the garden of the Museum of Natural History, but they looked picturesque rather than depressing. Whenever people had asked me about living on Staten Island, they would ask “why.” And I would answer: “because I didn’t know any better.” Which was partly true. When my family first moved to Staten Island, we’d been living in the United States for only three years. We didn’t really understand about good/bad or cool/uncool neighborhoods. We didn’t know about the importance of good schools. What we did know is that on Staten Island we could afford to live in a nice big house close to the ocean rather than in a tiny one-bedroom overlooking one of the worst Brooklyn neighborhoods. We moved to Staten Island because we didn’t know any better, but really because we couldn’t afford any better. In a few years, after I got a better grip on New Yorkers’ system of values, I realized that Staten Island was a lesser borough. Lesser, and somewhat despised. Even though the infamous Fresh Kills Landfill had closed in 2001, people kept asking how it felt to live at such close proximity of the waste. My son used to joke that he and his peers were all “children of the dump.” The city officials seemed to share the common view. And whenever a disaster struck, Staten Island would always be the last borough to receive help or to get adequate coverage in media. Ironically, just as I realized how unpopular Staten Island was, I fell in love with it. I felt incredibly lucky to live in a place where I could stroll along the deserted beach, or go search for clams at a salt marsh, hike in the dunes, walk along the cliffs, or go mushroom picking in the woods. I could certainly deal with an awful commute and the lack of good restaurants, or art-house movie theaters. My kids and my mother felt the same way. I decided that the decision to move there wasn’t the smartest choice, but the right choice for us at the time. As we drove across the Verrazano Bridge onto Staten Island, the sight wasn’t that bad. The ocean shone, calm and green. The trees still had some yellow leaves. The houses stood with roofs still intact. It was only as we got off the bridge and started driving down the Father Capodanno Boulevard, that the picture changed, and there was nothing picturesque about it. We passed houses with torn off walls. Houses where only bathtubs and toilets stayed in place. We passed boats swept into people’s backyards. 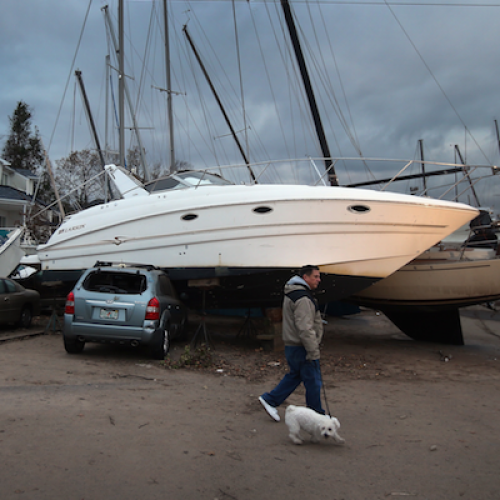 Boats that landed on top of the cars. Boats that landed on top of the roofs. We passed bent fences, mangled playgrounds, utility poles, lying on the ground like corpses. Garbage containers filled with chairs and sofas, and television sets and microwaves, and countless soaked mattresses. And of course, the debris, scattered everywhere. It’s amazing how easily the most ordinary household items turn into signs of destruction. There is nothing frightening or heartbreaking about a toothbrush, or a notebook, or a coffee mug, or a vial with prescription stomach medicine, unless they are lying all together in a puddle of mud mixed with sand. Still the most upsetting sight was a leafless tree, debris stuck to its branches like fruit. The streets weren’t lifeless, though. There were people everywhere, pumping water from their houses, sweeping up the debris, hanging their clothes and shoes to dry. Everywhere volunteers offered all kinds of help. Some distributed food and goods—diapers and blankets were two of the most needed items. Others even cooked the food right there on the streets, making hot dogs and hamburgers and vats with chili and coffee. A lot of people helped to clean up. Here and there, there were little makeshift stations for charging electric appliances, or using the Internet. Most of the volunteer effort was organized via Facebook. There, people asked for help and offered help. One man even offered to fix damaged computers for free. There were a lot of requests about pets. All kinds of pets, not only cats and dogs. When the house of the president of Staten Island herpetological society flooded, he managed to find volunteers to take care of his rare lizards. It took me a long time to get to my house from the South Shore. The electricity was still out, and the street signals didn’t work, so the traffic was especially slow. The utility poles were still on the ground, so all the streets surrounding my house were blocked with police tape. We had to drive on a hidden road leading to it from the back. The house looked fine. Completely fine. The roof was in place. The walls were still there. The basement was perfectly dry. The glass table on patio had shattered, and the tree in the backyard lost its largest branch. But that was the extent of the damage. On the inside the house was exactly the same as when I left it, empty, ransacked, but undamaged. I’m going to offer it to my friends, whose house was flooded, as a temporary haven. Lara Vapnyar is the author of Broccoli and Other Tales of Food and Love and Memoirs of a Muse.